Important: features depend on your operating system. Please choose it below to see the list of supported features. 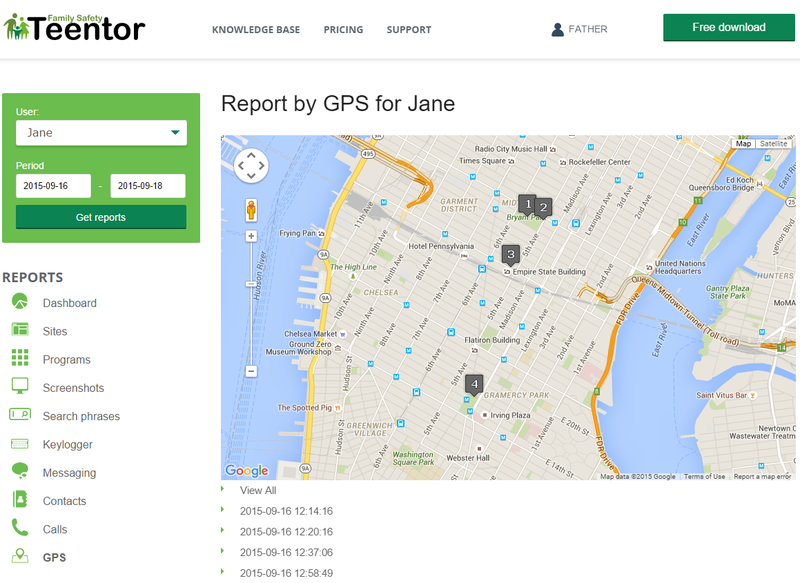 Teentor will help you find your child even without contacting him/her. The application reads GPS sensor data and sends it into your Control Panel. After logging in, you will be able to see the current and recent locations of your kid. Teentor can capture messaging in Skype and Facebook. The messaging history for each contact is available in full, the program captures messages of the both sides. 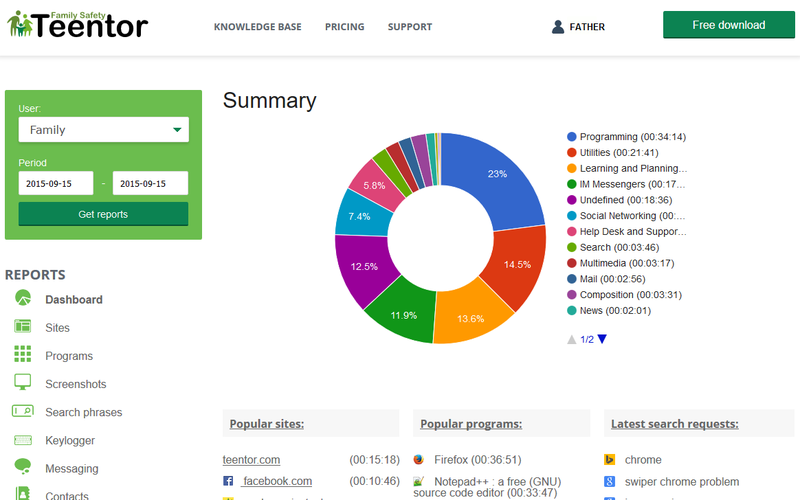 Teentor keeps track of all sites visited by your child. For your convenience, sites are combined into categories (for example, "Search", "Games", "Sports", etc. 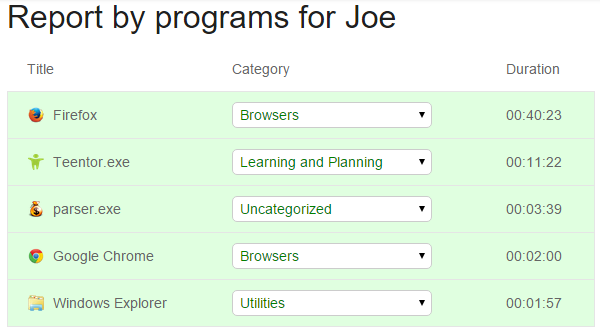 ), so you can easily pick out main interests and preferences. Time spent on each site is also logged. Besides internet sites, Teentor logs the use of Windows and Android applications (games, office applications, utilities, etc.). You can learn how long your child played on the computer and how much time he or she spent doing something useful. 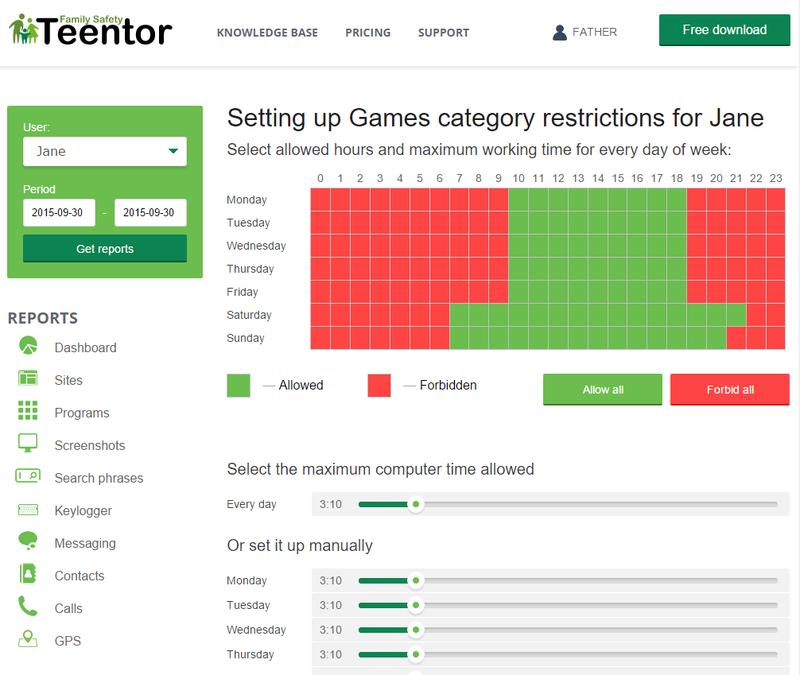 In addition to logging time spent in various programs and on various sites, Teentor is also capable of restricting access to sites and programs. If you add a site or a program to the restricted list, access to the site / program will be denied to your child. You can block by categories (for example, sites with pornographic contents), as well as individual sites and programs. To get a better idea what happens on the computer, you can activate screenshots. Teentor will take screenshots on a regular basis. Just like other reports, you can view screenshots in your control panel. Additionally, the program logs all search requests entered by your child on the internet. 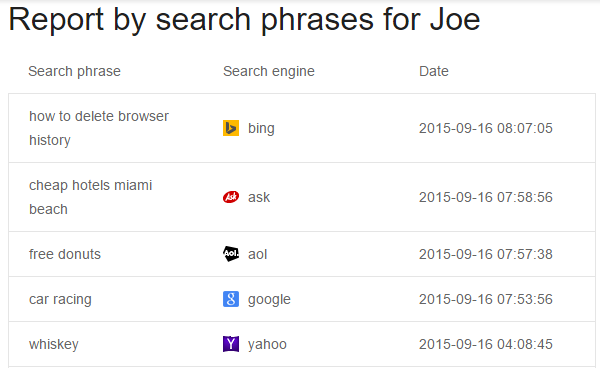 All popular search engines are supported, including Google, Bing, Yahoo!, AOL, etc. 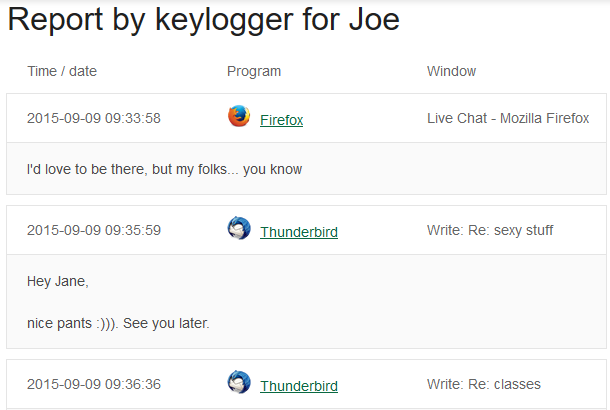 Keylogger will capture everything typed on the computer's keyboard. After activating this feature, you will get access to all text data entered by your child, including messaging in any program, forum posts, login data, etc. 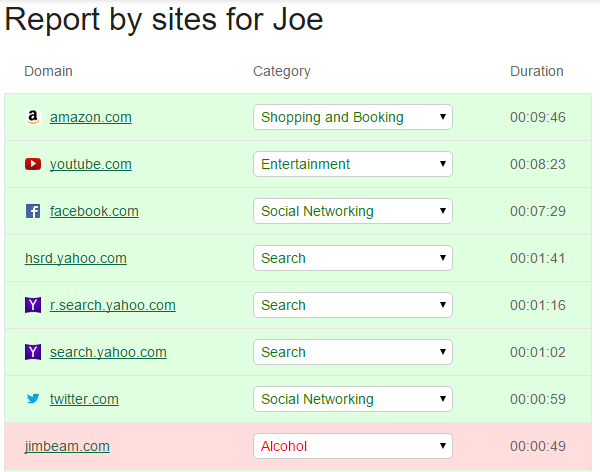 Teentor will filter unwanted contents in main search engines by enabling safe search. This will hide any results unsuitable for children (for example, pages or videos depicting violence etc.). 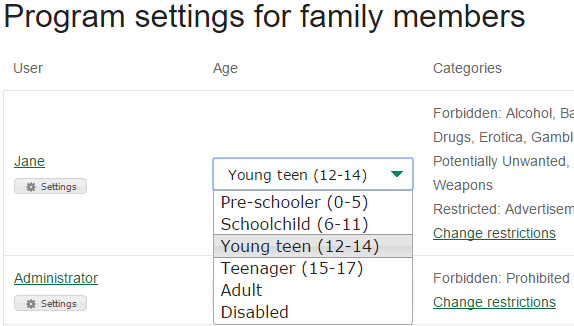 You can easily set up basic restrictions by choosing your child's age. Pre-installed values can be adjusted at any moment. For smartphones and other Android-based devices that support sending and receiving SMS, Teentor offers a feature of capturing all incoming and outgoing short messages. 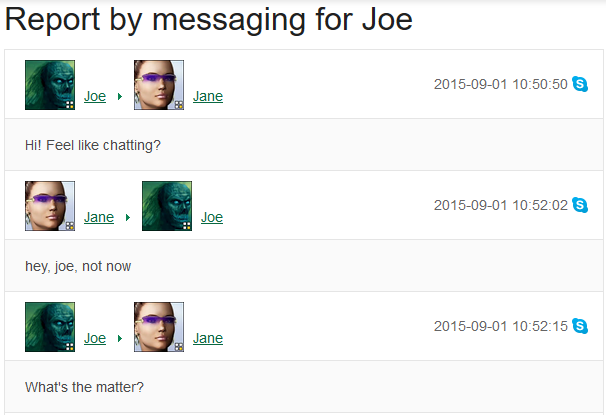 In your control panel, text of each message, its sender, recipient, date and time are shown. 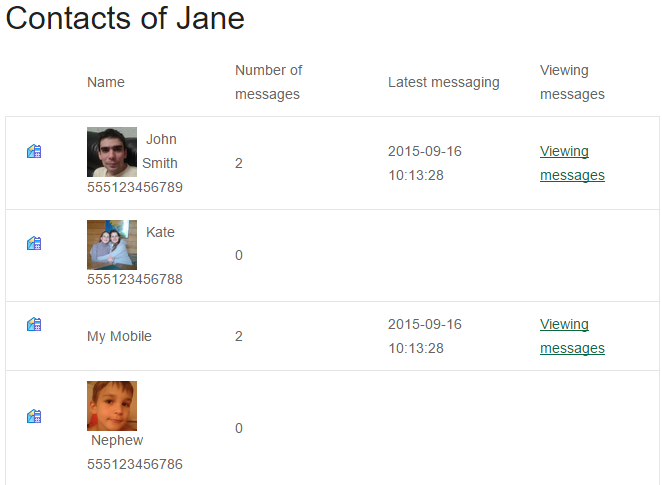 For your convenience, messages can be filtered by any contact, if you click the corresponding name or phone number. Teentor keeps record of all incoming and outgoing calls (on Android devices that support calls in cellular networks). In the control panel, parents can learn whom the child talked with and for how long. Date and time of each call, contact name, phone number, call status (incoming, outgoing, missed), duration are displayed. Additionally Teentor sends to the server all contacts (names and phone numbers and/or Skype contacts), which allows monitoring whom your child communicates with. With Teentor, you will be able to define how much time your child can play on his or her computer / tablet / smartphone. Time restrictions can also be applied to other categories. For each user and device, individual settings can be specified. Set different restrictions for different children, taking into account their age, maturity and other personal characteristics. Learn how much time you spend on various sites and in various programs. Accurate time tracking will help you organize your activities and free up some time for important things. Restrict access to the most distracting sites and programs to improve your own productivity. For example, block news feeds and ads to concentrate on a specific project or task. Try for free! Buy now!